Biology in Science Fiction: Vampirism as Disease? (1) Porphyria comprises seven separate disorders. Skin problems are a fairly common symptom, but only the rarest form--congenital erythropoietic porphyria--causes severe disfigurement. Just 200 cases of this disease have been diagnosed, surely too few to account for the widespread belief in vampires. In any case, alleged vampires exhumed in the 18th century typically weren't disfigured but appeared as they had in life (except for being dead, of course). (2) The idea that vampires abhor sunlight was an invention of fiction writers. In Europe during the 18th and 19th centuries, vampires were sometimes reported to have been sighted during the day. Bram Stoker's Dracula was deathly pale, but folkloric vampires, in the Balkans anyway, were said to be ruddy-faced due to blood consumption. (3) Porphyria victims don't crave blood. Drinking blood will not alleviate their symptoms, nor has there ever been a general belief that it would. The blood chemicals porphyria victims need do not survive digestion. (4) In light of the preceding, the scenario described in point #4 above [Porphyria symptoms can be brought on by stress - being bit by a sibling who also has the disease is stressful - the bite "causes" you to turn into a biter too] is unlikely. (5) No one has proved that garlic worsens porphyria. When I phoned, he didn't wish to speak to me and would say only that "it was just speculation" and that "I haven't worked in this area for many years." The response is a bit amusing in light of the fact that he lectured on the topic a just a few months ago. I guess the idea was just too interesting to give up. 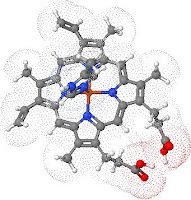 Heme molecule via Dr. Karl Harrison's Chemistry, Structures and 3D Molecules site. Actually, in Stoker's novel, Dracula does sometimes come out in daylight. The idea that vampires are allergic to sunlight was probably introduced by Hollywood. The classic SF treatment of vampirism as a disease was Richard Matheson's I AM LEGEND. I believe it was supposed to be a bacterial infection in the novel. I have to admit that practically most of this is beyond my comprehension, nonetheless, as a person who enjoys writing scifi it will become an invaluable resource should I need some serious biology in a story. Dolphin's theory is just another example of trying to make sense of something mystical. Sure, Porphyria exists, and it may have been responsible for the initial belief in vampires, but I think it is clear that when people think and talk about vampires they do not mean someone with an actual disease, but rather a mystical creature of nightmares. Thanks for this post, though, as it is clearing up some things for me in an ongoing discussion. It wasn't quite Hollywood that founded the lore about vampires being "allergic" to sunlight - but Prana-Film. In 1922, they released Nosferatu, eine Symphonie des Grauens - an illegal adaptation of Bram Stoker's Dracula (1897) - and it became the first source ever to introduce the lore of vampires being harmed in sunlight. It should be noted that in the novel, Dracula has no aversion to sunlight. Indeed, he is spotted in sunlight on a few occasions. Its only affect on him, however, is the limitation of his powers. But, back to the film. And it wasn't until 1943, that the lore of vampires being harmed by sunlight was introduced into American movies, with the release of Son of Dracula. Thus, the idea of porphyria being an inspiration for the much older vampire belief, is largely based on these non-traditional concepts. This is one of the reasons that makes Dr. Dolphin's premise extremely flawed. Although he wasn't the first to devise it (that "honour" probably rests with Nancy Garden's book Vampires, 1973), it is unfortunate he still perpetuates it as a solid theory, despite it having largely been discredited. Norine Dresser wrote an excellent chapter on the effect the widespread coverage of the theory had on actual porphyria suffers in her 1989 book, American Vampires: Fans, Victims, Practitioners. Look the whole idea could have been several disease that were lumped into one. Lupus causes in a small number sensitivity to light. they are probably pale and porphorin problem lets face it who has not had the urge to lick a wound. I assume that most of these disease have a paltry associated with them. so we have several disease that onset at different times or under different factors and whamo you get the legend of vampires. My thinking is that these type of disease are related with each other in some form or in some way. Shannah I think you are right, that the idea of vapirism arose out of more complicated reasons than some people having a disease. And Peeps is a great reading suggestion. Haha, vous les gens ne sauront jamais la vérité. You are all fools. I always find it amusing when people try to use science to explain the mystical. Not really talking about this article as such, but movies and books where vampires are portrayed as ordinary people who have contracted some kind of disease that makes their heart stop beating, gives them supernatural strength and powers, and make them so sensitive to the sun that they burst into flame on exposure. Right. Just like the zombie movies where some virus causes the dead to rise again and walk around looking for flesh to eat. All the time their bodies are rotting and most don't ever get anything to eat, yet their biological systems (muscles) still seem to work just fine. Sorry, but both monster ideas work so much better when we just resort to magic or fantasy than when we try to come up with a scientific explanation for the supernatural.